Moto3 and Moto2 Indianapolis – All Change! Loi and Rins first time winners at the Brickyard. Moto3 got race day under way with a frantic opening – the race was declared wet and tyre choice proved key to victory. Only those who had opted for slicks early on stood a chance as the track dried out rapidly, with the usual suspects nowhere to be seen after late pit stops to switch tyre. It was to be RW Racing GP rider Livio Loi who was smart beyond his years as the only rider confident enough to opt for slicks on the grid, which over the course of the race gave him almost a 40 second lead as he crossed the strip of bricks for the final time to take the first win of his career. The podium was awash with riders getting their first taste of success and it was John McPhee who scored second after a last minute change by the British rider and his SaxoPrint-RTG team saw him reap the benefits of a pit lane start on a slick. Joining the Honda pair in picking up a trophy in Indianapolis was Philipp Oettl , the Schedl GP rider pulling his KTM bike in at the first opportunity to take his first podium finish in third. Fourth went to a stroppy Romano Fenati, his arm waving enough to motivate his team into a flurry of action and speed to be the best of the rest in fourth with a determined performance by replacement at RBA Isaac Vinales enough to push him up to fifth. Enea Bastianini’s sixth saw the Gresini rider pick up points on Championship leader Danny Kent who started on wets. A slow pit change saw him finish down in 21st place – his lead in the championship cut to 56. Niccolo Antonelli (Ongetta-Rivacold) picked up seventh, Brad Binder (Red Bull KTM Ajo) eighth and Jorge Navarro took top rookie spoils in ninth for Estrella Galicia 0,0, two places ahead of his team-mate Fabio Quartararo. The pair were split by the Mahindra of Jorge Martin as the trio of new recruits circulated together, again the best rider for the manufacturer. The remaining points went to Karel Hanika (Red Bull KTM Ajo) in 12th, Andrea Locatelli (Gresini) in 13th, Jules Danilo (Ongetta-Rivacold) in 14thwith Hanika’s team mate Miguel Oliveira winning his battle with Tonucci for the final point. Efren Vazquez and Francesco Bagnaia both failed to finish. It was the drying track which caused problems for the Moto2 riders, all opted for slicks as they fought hard for the thin dry line with the lead changing lap after lap as the riders found their confidence. After early showings by Sam Lowes, Hafizh Syahrin and Julian Simon, all of whom crashed out and much shuffling at the front, the lead battle at the mid way point boiled down to a dogfight between Dominique Aegerter and championship leader Johann Zarco, both of whom barged their way to the front after poor qualifying performances. It was to be Rins’ increase in pace that would prove enough as the pair warred on to pull out a tiny but significant 0.4 second lead, handing him his first Moto2 win in his rookie season. Zarco held on for second for Ajo Motorsport, increasing his title lead to 71, with Rins moving into second overall. Morbidelli zipped into third for his podium debut, leaving Technomag Racing Interwetten man Aegerter to settle for fourth. 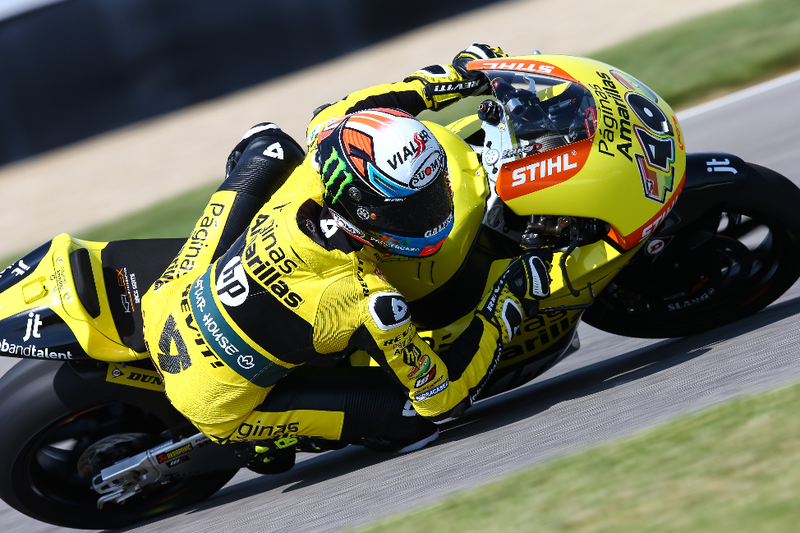 Tito Rabat looked uncertain and not ready to push in the tricky conditions with some strong passing demoting the EG 0,0 Marc VDS rider to fifth, ahead of the nearing Tom Luthi in sixth for Derendinger Racing Interwetten. A strong final few laps pushed AGR Team rider Axel Pons to his best ever finish in seventh, just ahead of our winner in Germany last time out Xavier Simeon in eighth for Gresini. Taka Nakagami secured seventh for the Idemitsu team ahead of Rabat’s rookie team-mate Alex Marquez in tenth. Azlan Shah cemented a strong showing in the USA with a eleventh place finish on the second Idemitsu entry, while Jonas Folger took twelfth after a trip off track over the iconic Indy rumble strip. Ant West (QMMF) took the chequered flag in 13th, Marcel Schrotter (Tech 3) finished 14thwith Robin Mulhauser bringing home his first championship point on the last of the Interwetten bikes. Also failing to finish were Xavier Vierge, Randy Krummenacher, Louis Rossi, Ratthapark Wilairot, Sandro Cortese and 2104 winner Mika Kallio.